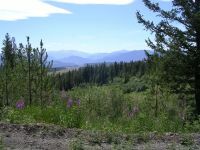 The mountains in Marble Range Provincial Park feature caves, sinkholes and disappearing streams, as well as cliffs, chasms, and crenellated ridges. The park protects populations of California bighorn sheep and mule deer. There are some rough trails, popular with local hikers, hunters and horseback riders. The trails are not maintained and only very infrequently patrolled. Please practice 'No Trace' camping and day-use. Wildlife viewing is popular in the Marble Range. Please use binoculars and keep your distance to minimize disturbance to the California bighorn sheep and other animals. In the spring and early summer it is usually possible to find and melt snow for drinking water. Later in the season you must carry all the water you need if you plan to camp in the alpine or sub-alpine.